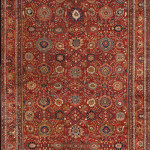 Haji Jalili Style Tabriz Carpets. What is the difference between Heriz, Serapi, Gorevan, Bakshaish Carpets? A Comparison of Kazak and ShirvanCaucasian Rugs.